Nordic Office of Architecture and Haptic have won the competition to redesign the Norwegian government headquarters after it was damaged during a fatal terrorist attack six years ago. The winning proposal called Adapt was developed by Nordic Office of Architecture and Haptic under the same Team Urbis. 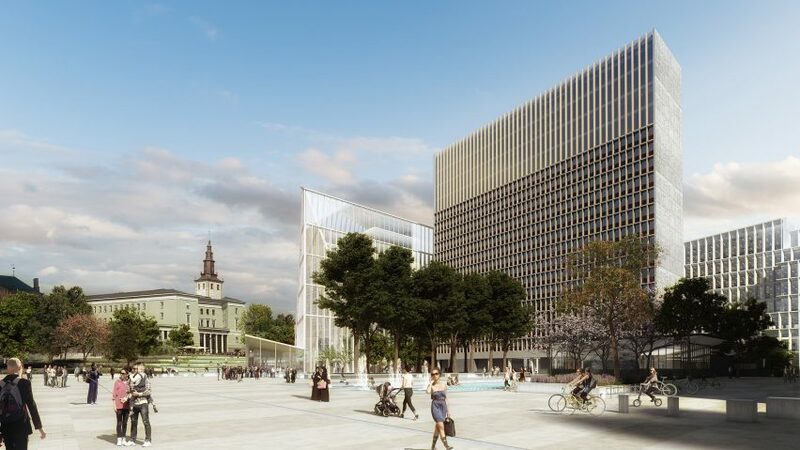 The architects are working with engineering firm Ramboll, landscape studios SLA and Bjørbekk & Lindheim, and consultants Asplan Viak, COWI, Aas-Jacobsen, Per Rasmussen, Scenario Interior Architects MNIL and NIKU on the building that will be a centre of decision-marking for Norway's government. Their design comprises seven blocks building containing 4,500 workplaces, which will be surrounded by parks, squares, cafes and a visitor centre to provide a place for its citizens to enjoy. One of the blocks on the edge of the park will feature a dramatically pitched roofline, while the others will have flat roofs. The winning design was selected following a competition announced in 2016, and two contenders were whittled down earlier this year. The brief was to redesign the government headquarters following the attack on 22 July 2011. A tower block housing the prime minister's office in the Regjeringskvartalet, the government quarter in central Oslo, was targeted by a car bomb. The attack killed 8 people and injured a further 209. The buildings sustained serious damage in the blast, prompting Statsbygg, the Norwegian Directorate of Public Construction and Property, to put out a call for proposals to redevelop the area in line with new security measures. "We have developed Adapt based around the words dignified, inviting, friendly and timeless," said Gudmund Stokke, principal partner of Nordic Office of Architecture, and head of Team Urbis. "We wanted to design a Government Headquarters that is an attractive place for visitors, that communicates Norwegian ideals of transparency and democracy and that is an inclusive and exemplary workplace," he added. The Statsbygg said that Adapt was "the clear winner", with the jury praising the way the scheme created a relationship between the building and the streets. Buildings will be set back behind glass facades that allow daylight to fill the offices, creating a connection between the interiors and the surrounding urban fabric, as well as symbolising government transparency. As well as the parks, the roofs of the buildings will be multi-functional green spaces in the city centre. The streets and squares will be open to pedestrians and cyclists and accessible 24 hours a day throughout the year. Vehicle access is restricted, and other new security measures are being kept tightly under wraps. "This is the largest and most significant project we could contemplate as architects and consultants," said Stokke. "It is a task of historical significance and one we undertake with humility and the greatest respect." The bombing was the first of two politically motivated attacks on Norway's government and people carried out by convicted terrorist and mass-murderer Anders Behring Breivik. In total, 77 people were murdered in the deadliest attack on Norwegian soil since the second world war. A van packed with fertiliser and fuel oil was detonated in the Regjeringskvartalet, killing eight people. The shockwave of the bomb blew out windows on all floors of H Block, which housed the prime minister's office, and the Ministry of Justice and the Police. Fires burned in the surrounding buildings and the street was filled with debris. Two hours later, Breivik opened fire on young people attending a summer camp run by the youth division of Norway's Labour party on the island of Utøya, shooting 69 people dead. On the fourth anniversary of the attack a ring-shaped sculpture inspired by a forest clearing was unveiled on Utøya to memorialise the victims of the massacre. In 2016 a learning centre was erected on the site of a cafe on the island where 13 people lost their lives, enshrining the buildings where they died. A controversial memorial in the form of a landscape intervention was scrapped this year following fierce opposition from local residents. Swedish artist Jonas Dahlberg won a competition to design a monument with Memory Wound, where he proposed cutting a slice out of the headland of the Sørbråten peninsula, across from Utøya. In response, local residents sued the state.